It was a beautiful day for a hike with Hike Leader Dan Ralston! Due to the closure of Skyline Drive because of snow and ice we decided to do the Flat Top Mountain Loop and it turned out to be a perfect hike. We had crisp winter weather, a slight breeze, the sun peeking out between the light clouds and snow covering the ground beside the trek. We were be able to enjoy the expansive panoramic views of the mountains; of both the Piedmont and the SNP. 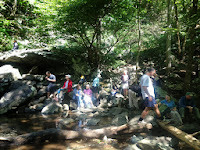 We had PATCers popping up from everywhere to join the hike. We started at AHS with Jeanne Densmore, Wanda Hamilton, Kelly O’Rourke, Kelly Guelli and Anne Colgate. We made our way to the little country church to park and when we got there Dave Borszich drove up to join the group. The hike was uphill from the church but the beautiful weather, the woodland farms and the feeling of a wonderful day’s hike ahead set the pace. 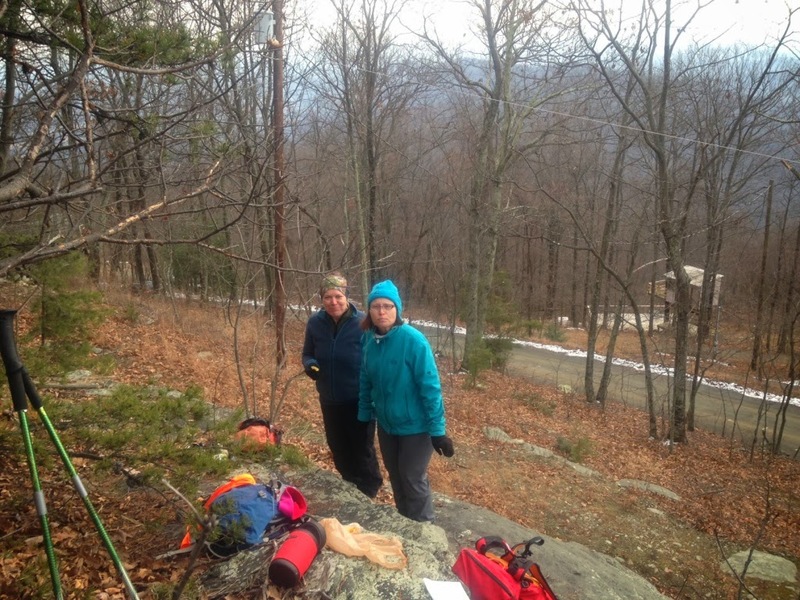 Kelly O’Rourke and Jeanne lead the charge up the mountain. Once at the top we settled in on the sun heated rock outcroppings for a well-deserved lunch and a wonderful view. Low and behold John Brandt and Clai Lange hiked in to join us. So our original group of 6 was now a happy group of 9. We stopped by a newly reconstructed log cabin and met one of the colorful locals hanging out with his Scottie dog whose name we had to guess. Kelly Guelli guessed it right off! However this blog being family oriented we won’t print the pooch’s name here. But the dog did come to the name so we guessed it was for real. We finished the hike laughing at the day’s events. One the way back to Charlottesville we stopped at the Moss Vineyard in Nortonville for a tasting and then headed back to AHS. 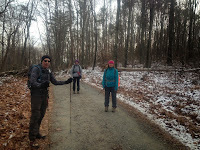 A perfect hike with a perfect group of people in the winter forests of the Virginia Piedmont. This hike offered access to a classic regional destination, but from a different direction than most people take. Rather than hiking up the steep climb from Humpack Gap Parking, we drove further south along the Blue Ridge Parkway to begin our hike at the Humpback Rocks Picnic Area. We followed a short side trail from the picnic area which connected us to the Appalachian Trail, which we then followed northward. Though there were still some decent grades along this section, they were generally short and didn't pose much of a challenge... and certainly less tedious than the slog up the trail most people use. After a short stop to admire the view from near the summit of Humpback Mountain, Hike Leader Ken Moss cleverly led the group the wrong way on the trail for a few minutes, just to see if they were paying attention... happily they passed this test and we soon resumed our our hike in the correct direction toward The Rocks. Once at Humpback Rocks we admired the views and also had a treat, witnessing a marriage proposal by a young couple, with our own Maynard Davis acting as the impromptu official photographer. The hike back to the cars was uneventful. The entire group, including Wanda Hamlin, Joanne and Maynard Davis, Leon Gorman, Kelly O'Rourke and Dave Borszich, stopped by Blue Mountain Brewery on the drive back for a bite to eat. This turned out to be a perfect day for a hike on a trail with wonderful views. 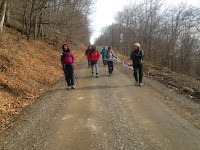 Eleven hikers met Hike Leader Ken Moss at Albemarle High School and the subsequent drive to the trail head at Browns Gap. The temperature was perfect with calm winds and clear skies. Hiking along what was often a ridgetop trail with easy grades offered wonderful views toward the Valley. The lunch stop was ideal and everyone enjoyed good conversation while munching on their victuals while admiring the view. The hike back was equally easy. Following the hike, most of the group gathered at Timberwood Grill for après hike munchies. 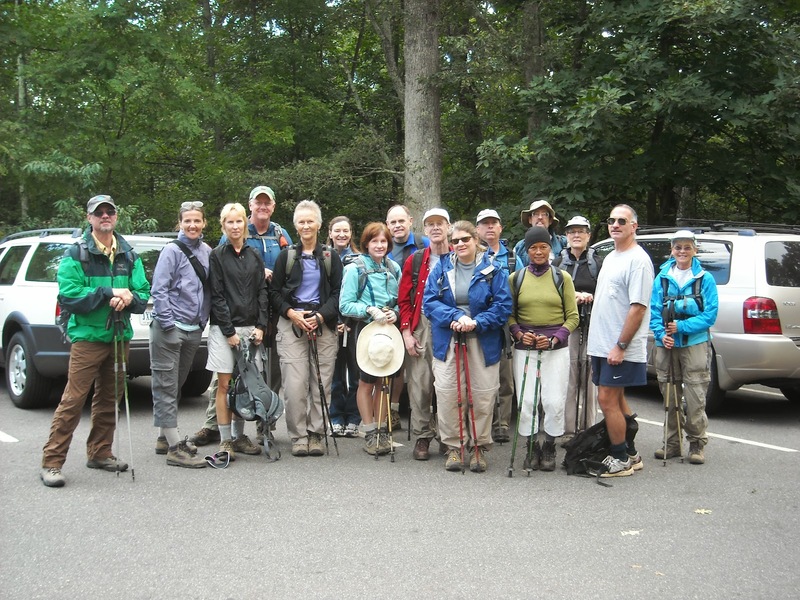 Participating in the hike were Wanda Hamlin, Dan Ralston, Bev and Pete Fink, Barbara Schenefield, Brad Young, Kelly O'Rourke, Anna Castle, Dianne Anderson, Jeanne Densmore and CJ Woodburn. Nine hikers and one dog made it up to Shenandoah National Park to enjoy a beautiful autumn day and trek the Turk Branch circuit and out and back summit to Turk Mountain. The group included Jeanne Densmore, Kelly O'Rourke, Bev & Pete Fink, Brad Young, Leon Gorman & Bayly, John Brandt, and leaders, Marit Gay & Mark Trail. 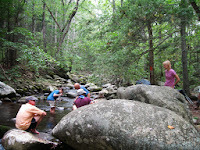 The 10.4 mile route began at Jarmans Gap, near MP97, as we descended down the South Moormans River Fire Road. Leaves of gold and orange lined the forest as we crossed feeder streams of the Moormans River multiple times. At the intersection we stopped for a snack of homemade pumpkin chocolate chip cookies and caramel corn then followed the yellow blazed Turk Branch Trail upward 2.6 miles with a 1200' elevation gain. When we reached the Turk Gap parking area we crossed the Skyline Drive and then veered right to take the 1.1 mile, 1200' climb up the Turk Mountain Trail to the summit for our lunch break. After our meal we descended back to meet the Appalachian Trail going south stopping at the Sawmill Run Overlook for more views of the fall colors. Bucks Elbow and Middle Mountain could be seen to the east as we continued back to the Jarmans Gap parking lot. Glimpses of Calf Mountain and Humpback Mountain were also visible. Warm temperatures and sunny skies made us appreciate the day so much. We know winter is just around the corner! The closing of the national parks did not deter us from taking a group hike, although the original location on the Turk Branch Loop in the Shenandoah National Park had to be changed to an out and back on the Blue Ridge Parkway. We went south on the Appalachian Trail from Reeds Gap up 1050 feet elevation to Hanging Rock. 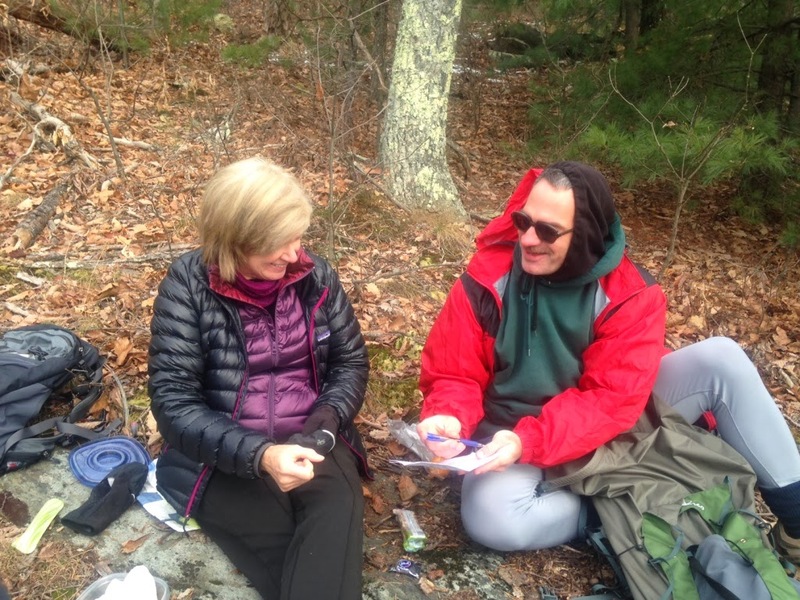 Fourteen hikers made the 7.4 mile trek including Susanna Williams, Bev & Pete Fink, John Brandt, Kelly O'Rourke, Emerald Young, Dan Ralston, CJ Woodburn, Susanna Keller, Eric Bredo, Mark Perschel, Michael Seth, Barbara Martin, and hike leader, Marit Gay. 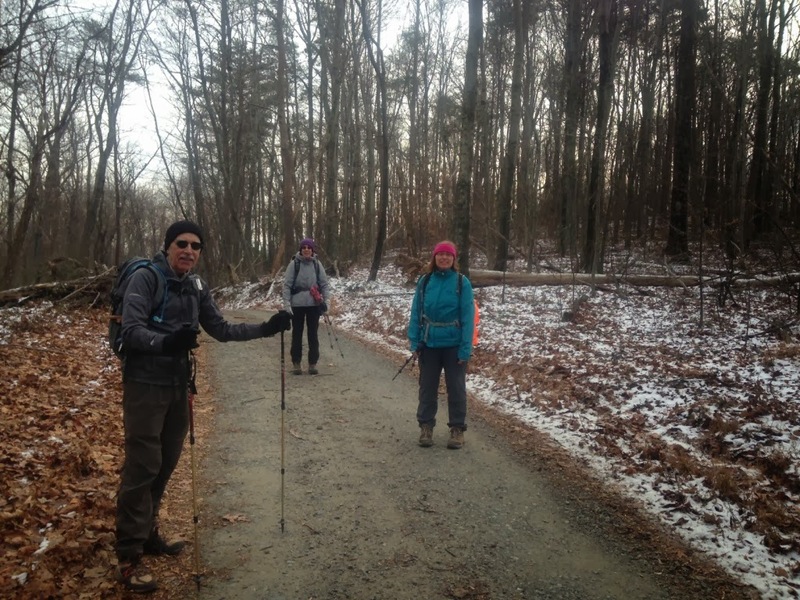 We headed out on a beautiful, but unseasonably warm day from Reeds Gap, stopping at the Mau Har Trail intersection for snacks, including Mark's caramel popcorn. Privy breaks at the Maupin Field Shelter were also taken. Then we continued to climb to Hanging Rock to enjoy views of the Three Ridges and The Priest. Hazy, but scenic views made for an enjoyable lunch respite. We back tracked to the parking area and 11 members of the group ventured down to Devils Backbone Brewery for much needed refreshments. We were happy to be able to enjoy the mountains when so many were not able to because of the government shutdown. 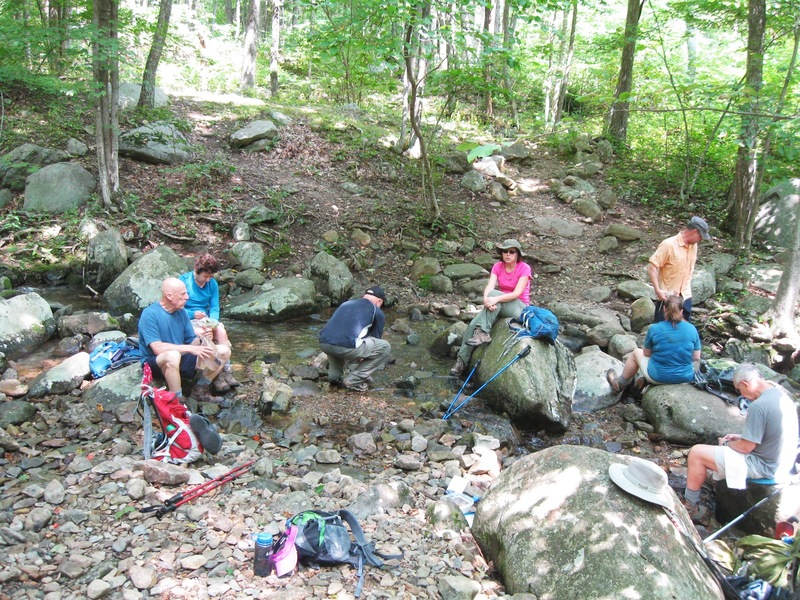 If things open back up the original plan to hike the Turk Branch Loop and Turk Mountain will happen on November 2 instead. 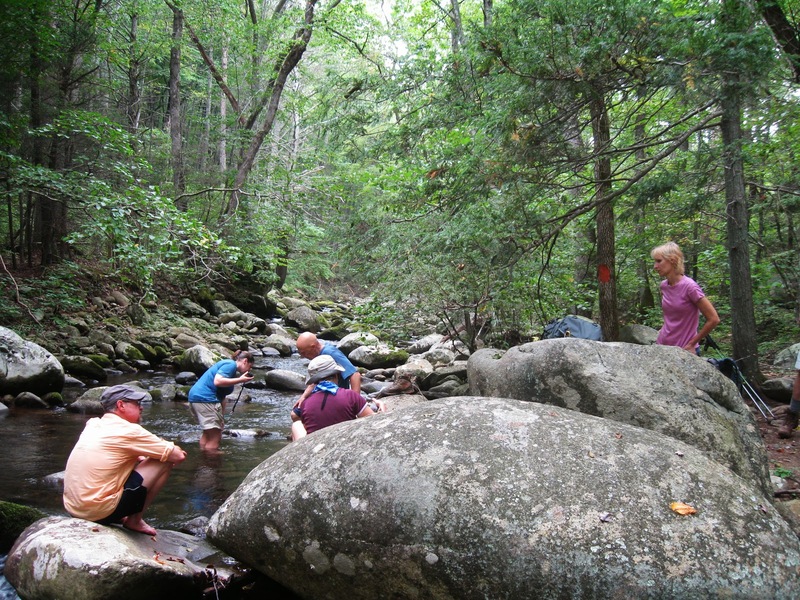 On National Public Lands Day, Shenandoah National Park carries out projects to improve specific areas of the park. One of those projects, which the chapter participated in last year and this year, was clearing black locust at Big Meadows in order to have an open grassland area. This year, at the northern end of the open area, volunteers cut locust with loppers and small saws. Afterwards, a Park Service biological control technician sprayed the stumps with herbicide to prevent regrowth. A couple of people from previous clearing projects were glad to see the Charlottesville touch of lemon raspberry cake. 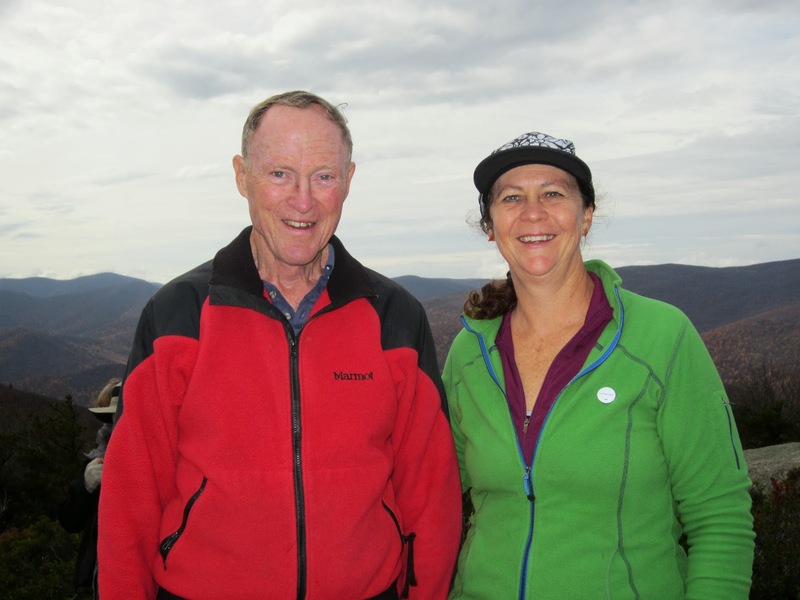 The Park Service offered volunteers small gifts in appreciation of their efforts. A couple of previous trips found some trees down on the northern part of the Chapter’s section of Appalachian Trail between Rockfish and McCormick Gaps. 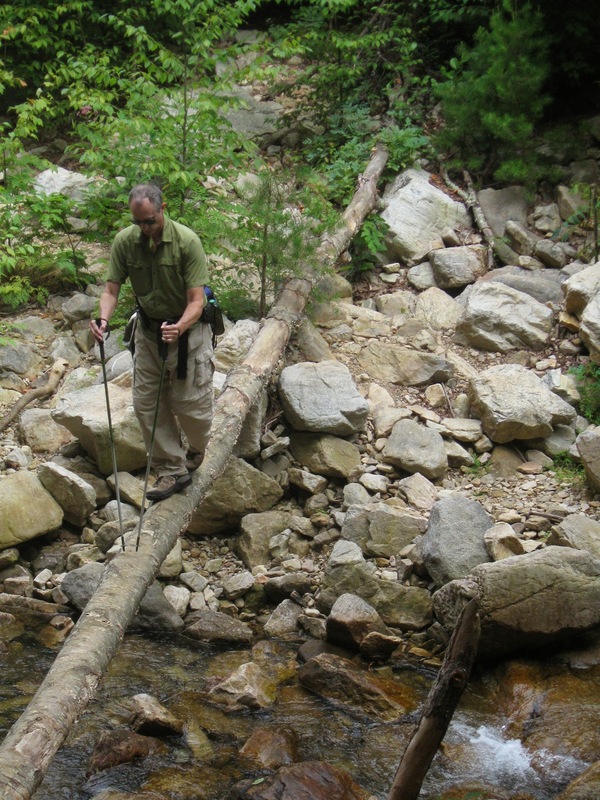 Today, John Herrity came to help remove the fallen trees; while with the Carolina Mountain Club, he participated in numerous trail worktrips, although today’s reliance on hand saws was different from what he was used to. We drove through fog to McCormick Gap, where John H. thought that the initial breath-taking climb might have been an initiation rite. After some easier walking, we came to the first downed tree. This tree fell in a storm early this year but did not fall to the ground until last week. At two of the trees, we made the two needed cuts at the same time but took turns making one large cut on another log. At the last log, John H used a fork in the tree as a lever to push it off the trail, which was possible because of a cut made earlier this year. We declared lunch because my memory said that we had cleared all fallen trees; yes, my GPS had a record, but I did not find it earlier in the day. While eating, we looked up to see John Brandt emerge out of the fog, disappointed to find that his bowsaw was not needed. With the primary mission of the day accomplished, and the mist turning to light rain, we proceeded to the entrance station where John B took me to get my car from McCormick Gap. As expected, we encountered some delays returning to Albemarle High caused by football traffic but still returned earlier than expected. On successive weekends, I went to preserve, or even extend, previous efforts to slow invasive plants at Rockfish and McCormick Gaps. The main targets were Oriental lady’s thumb, bittersweet, and ailanthus. I found regrowth, of course. The good news is that the regrowth of lady’s thumb at the trailhead at McCormick Gap was less, and some areas have less bittersweet than previously, so the efforts of the past are having an effect. However, beyond the previously cleared area, lady’s thumb grew prolifically, and was flowering, so that cutting might spread if further. There were also some ailanthus sprouting in an area where there are no known mature ailanthus trees. There were several blowdowns lying on the ground, which are not significant obstacles, but need to go. 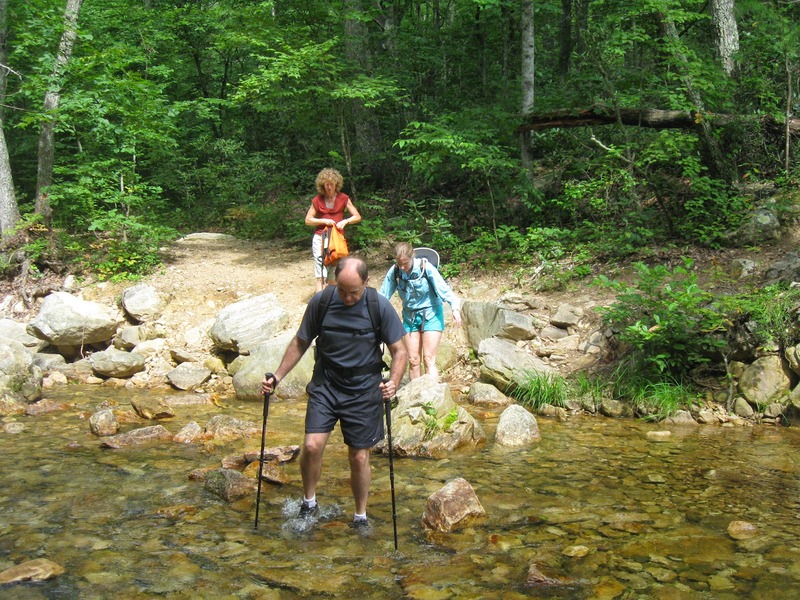 With summer still effective, and it being a holiday, a water hike without lots of climbing seemed appropriate, so off to Nicholson Hollow. Seven of us left Charlottesville and met Kelly Gueli and Mike Brown at the crowded Old Rag parking lot. Early on, it felt hot and humid, but further up the trail, that feeling disappeared. Despite recent rain, the river was not high and thus easily crossed. After the last crossing, we were near a large swimming hole, where we found a large, quiet timber rattler which slowly moved. Perhaps that was why there was no interest in swimming, so we pushed on, even those who initially wanted to hike only 5 miles. At Corbin Cabin, we ate lunch in the river, and were greeted by Blue-Blazed Central District Manager Patrick Wilson who was running along some trails for a quick inspection. He recognized some of us from the Little Calf relocation project. recording the trail to ensure that the PATC map is up to date, stayed with the main group rather than seeing the whole trail. 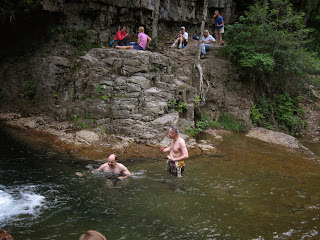 On our way out, we paused at one of our classic swim holes, but the group decided to keep going and found a couple of pools where fish tried to eat CJ Woodburn’s feet. One carload stopped in Etlan for ice cream before heading into a very heavy rainstorm, which slowed us down. In our concern to get back in time to avoid football traffic, we did not know that the football game was delayed by the storm. We wondered whether the many people on Old Rag also experienced the lightning and heavy rain we did. 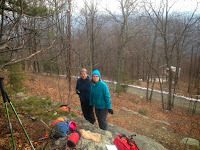 Others hiking today were Lindsay Brown, Bev and Pete Fink, and Kelly O’Rourke. 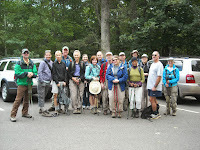 This was a joint hike between the PATC - Charlottesville Chapter and the PATC - Southern Shenandoah Valley Chapter. 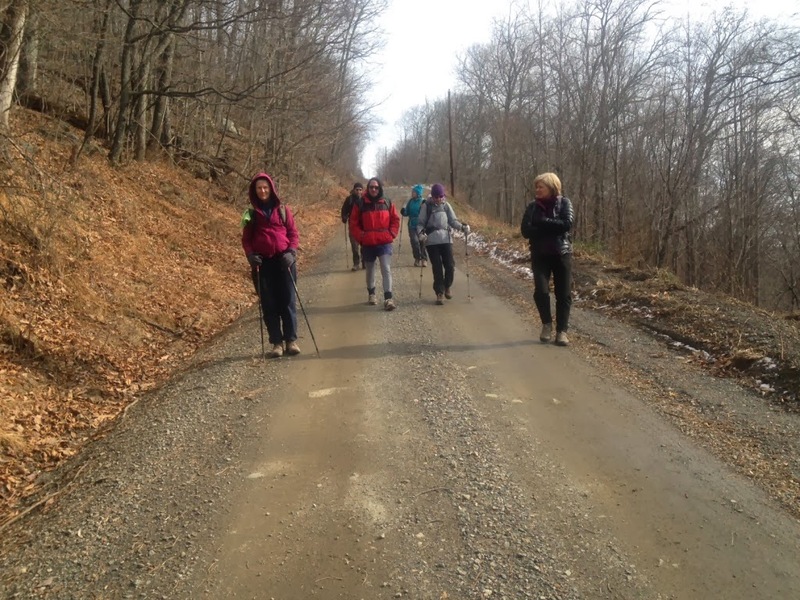 The hike was dedicated to Iva and the memory of her father, who passed away this week. 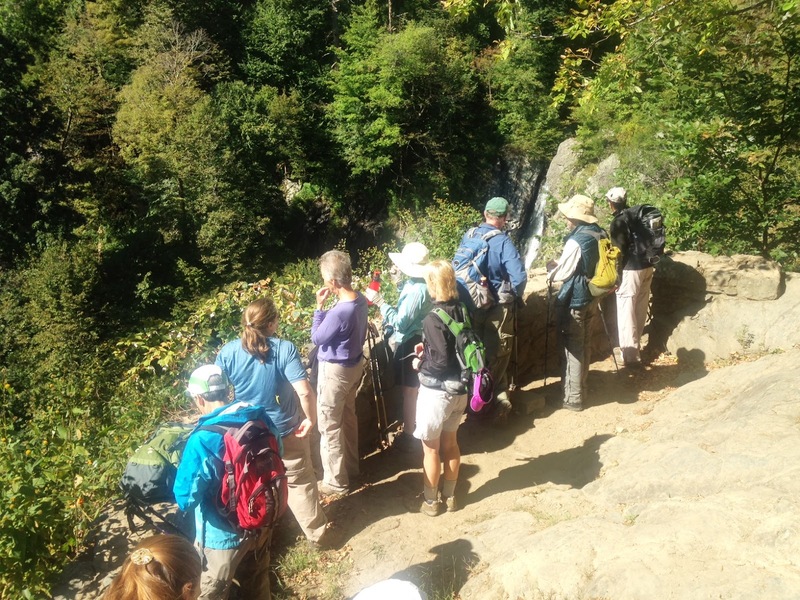 We had 17 people show up on this beautiful Fall day to hike: Dan Ralston (hike leader), Karen Waterman (co-hike leader, SSVC), David Carter, Emerald Young, Brad Young, Ken Moss, Marian Styles, Kelly O’Rouke, Christine Ballard, CJ Woodburn, John Brandt, Mike Waterman, Michael Grogh, Roxann Atwood, Wanda Hamlin and Bryan Burns. We also had a guest from DC join us, Laura Kasper, who is a psychologist moving to the Charlottesville area. She did a Google search for a hiking group, found us and showed up for the hike. The weather was perfect although it started off a little cloudy. The sun soon broke through the clouds and the day turned out to be gorgeous. At the bottom of the loop trail lies the South River Falls and today it did not disappoint us; twin falls flowed to the basin below, where we spent an hour having lunch at the base of the beautiful falls. 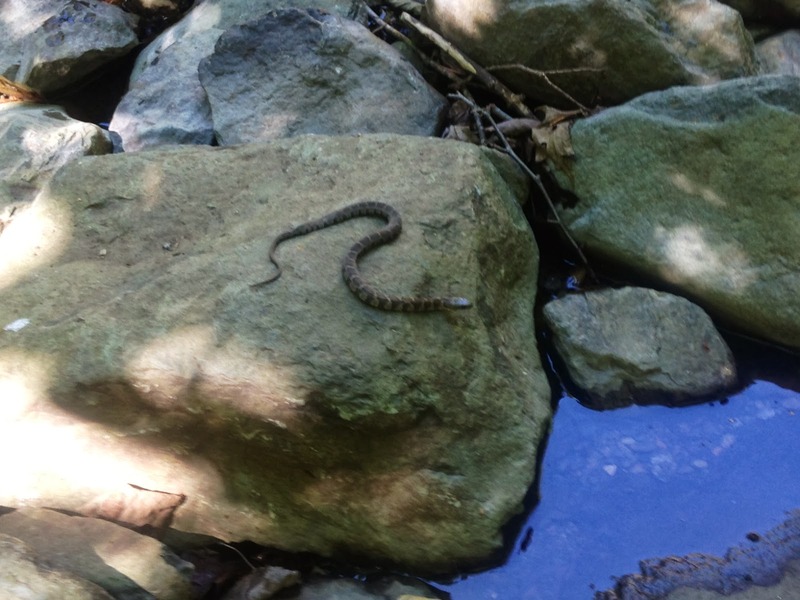 We were joined by a young Northern Water snake but he kept his distance sunning himself on a rock. Kelly, Marian and John decided to add a few miles to the hike and took a side hike on the Pocosin Trail to pass by the ruins on the return hike. A perfect hike on a perfect Fall-like day. It could not have been a better hike. Eleven hikers enjoyed a beautiful September day including Rita Kieffer, Emerald Young, Katherine Maus, Brad Young, Kelly O'Rourke, CJ Woodburn, Dan Ralston, Dave Borszich, John Brandt, Mark Perschel, and hike leader, Marit Gay. 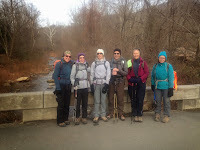 We began the approximately 8 mile hike at Slacks Overlook on the Blue Ridge Parkway, milepost 20, taking the Slacks Trail to the Torry Ridge Trail. This was a nice ridge line descent toward Sherando Lake following into a short section of the Blue Loop Trail. Fortunately co-leader, Mark Perschel, was able to steer us the correct way and then join the steep Dam Trail to reach the Lakeside Trail to make our way along the lake to the beach and picnic area. Sherando Lake Recreation Area is in the Pedlar Ranger District of the George Washington National Forest and has been a local favorite for generations since 1936 providing swimming, hiking, and camping. The 25 acre spring-fed lake enticed John, Brad, CJ, and Marit to take a dip during lunch. Others sought shade in the beautiful, native stone and timber blend shelter built by the Civilian Conservation Corps to partake their meal. At 1 pm we divided into two groups to allow those needing to return sooner to resume their climb back up the mountain via the Blue Loop Trail back up to Torry Ridge Trail ending back at the Slacks Overlook. An added feature to the day was an invitation to take a trek to Waynesboro to hear PATC member, Barbara Martin, sing with the Liz Barnes Trio at The Gateway venue. CJ, Mark, and Marit were treated to a delightful evening of blues and jazz. Overall a wonderful day in the Blue Ridge Mountains and Shenandoah Valley! Today’s attendees: CJ Woodburn, Marti Snell, Katherine Maus, Christine Ballard, Neil McKinney, Brad Young, Bill Holman, John Shannon, Marian Styles, Ken Moss, Andy Willgruber, Briana Taylor, Joanne Davis, Kelly O’Rourke and Bella, Karen Ramsey, Dave Borszich, David Carter, Debra Fisher, and Leon Gorman and Bayly. and again and again and again until we were back to the cars. Terrific day to hike in the Wilderness!